Your Opinion Matters. Leave us a true and honest review on Google Yelp or Yahoo & Receive $15 off any service. You're the best part of what we do. Its been an honor serving you! "We Continually strive to deliver amazing customer experiences. we have a vision to give people the customer experience they are searching for"
"For my 21st birthday my friends and I decided to go to Executive Tattoo Lounge. These guys are really the best! I had never gotten a tattoo before and I was really nervous about getting one, especially in Las Vegas where I didn’t know much about the tattoo places around town or tattoos in general to be honest. I was in Caesars Palace playing roulette when a women sat down next to me, her whole arm was covered in tattoos. I found myself just staring at them, almost mesmerized. Maybe it was the alcoholic drinks they were serving, but I was really drawn to her tattoos even though I had never even thought of getting a tattoo before. The looked almost like a painter had done it because they incorporated these vivid water colors. I decided I just had to ask her about the story of her tattoos and what they meant. She was very kind and went on to start explaining each tattoo and what they symbolize. She also told me that they were a new school tattoo style explaining why I had never seen it before. I asked her how she came up with the idea because I’ve always said if I were ever to get any tattoos they would have to be very meaningful. That’s when she told me about Executive Tattoo Lounge. She told me she had been going there for years and you literally can’t find anyone better. I decided to check out the shop when my friends and I were exploring around town one day. We went in and glanced around, looked at some pictures in the tattoo gallery and talked to a few people who were also browsing. One of the artists came up to ask and asked if we needed any help or were looking for anything specific. I began explaining my situation, that I’m not sure what I want, I want it to be meaningful and that until two days ago I never even thought of getting a tattoo. We then got into a really great discussion on self-expression and the positive aspects of tattoos. He told me to come into the back room and we literally just sat down and started having a conversation. I told him about my interests, including basketball and astrology and just little things about myself such as the importance of family and friends and my aspirations in the future. The whole time I was talking he was drawing. I felt sort of like I was in a therapy session and he was “writing down my problems”. When I had finished talking he produced the most beautiful tattoo I ever seen. It incorporated both my zodiac and my mother and younger brother. It literally brought tears to my eyes and the vivid watercolors incorporated in it really made it pop. This shop is filled with so much talent. I’m so thankful that I happened to stumble upon it because I don’t think I would have ever gotten an idea as meaningful as the one he gave me. I look at my tattoo and it makes me feel complete. I’m saving up now for another trip to Las Vegas just for my next tattoo. I’m completely in love with this shop and honestly they’re the only ones I trust to make permanent changes to my body. As a kid, who didn’t love to paint with watercolors? Watercolor tattoos are a great way to keep part of your childhood alive and with you always. For a design, just think of one of your favorite pieces of art that you did as a kid or one of your children has done (if you have kids of course). If you decide to get something of that nature, every time you look in the mirror, you will always be able to have that as a constant reminder of your childhood or loved one. Watercolor tattoos can look so beautiful. They look as if an artist has taken a brush and painted a masterpiece on your body. These tattoos are so unique and elegant, that they are sure to catch the attention of others and set you apart from those with normal tattoos. The design possibilities are truly endless. Whether you are looking for a contemporary, modern, or any other type of look, watercolor tattoos should definitely be one of the top choices for you to consider when getting your next tattoo. If this is your first time getting a tattoo, then you should strongly consider getting a watercolor tattoo as well. These tattoos are easily added on to so that you can create a truly wonderful work of art on your body over time. Starting new designs on your body can often be a difficult task when you have existing tattoos. But if you decide to do a central theme, the watercolor effect is sure to please all tattoo enthusiasts. In the past, some myths have been thrown around that watercolor tattoos tend to fade. If you are worried that getting a watercolor tattoo is not worth it because it may fade due to the delicate nature of watercolor tattoos and their more mellow accents, then have no fear. This is simply not true! 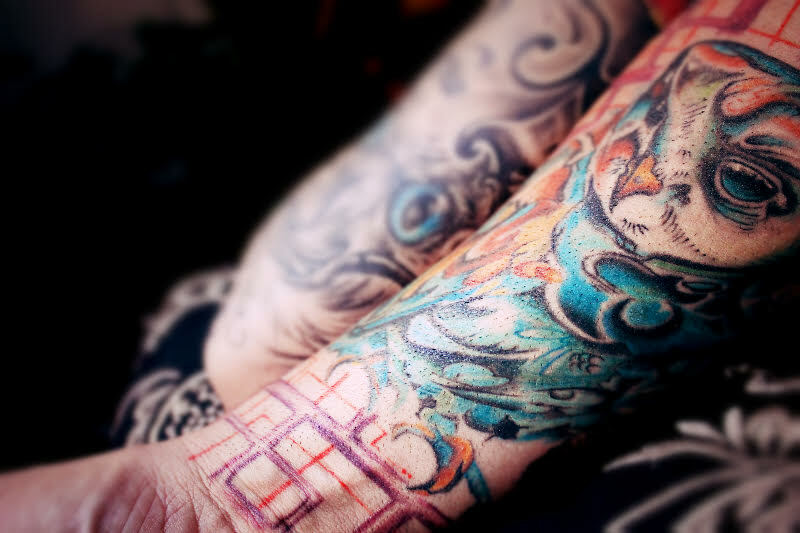 You need to take care of your tattoo (same goes for any other type of tattoo) but if you keep up simple maintenance, you should have no problem with fading or any loss of color that may take away from its beauty and elegance. If you are still worried about fading, then simply choose darker colors! There is no problem with having darker more distinct colors while still keeping the watercolor style." Inx is awesome! Inx is awesome! Great work! Gave me a good deal. 100% satisfied with his work. Definitely will drive all the way from California to get work done by him. Michelle ‎ - Sep 28, 2011 Their work is absolutely awesome!! They really great work and have awesome customer service. I just got my first tattoo there and will definitely be back once I figure out my next one! The Las Vegas Tattoo Lounge is amazing because I always need someone to talk to when I'm getting inked up with a new pic. Don't you just hate it when you try to make small talk with the tattoo artist? I do! I hate it when I say something to the artist and then they just glare at me with their faces, making no response. At first I thought it was my heavy cockney accent (I'm from the Land Down Under), but then I realized that most tattoo artists don't do much of any talking. This is why Tattoo Lounge is so great! I don't always get a tattoo, but when I do it's at this place! Marcos ‎ - Sep 25, 2011 I have been to a couple of upscale tattoo parlors but nothing compares to my visit at Executive Tattoo Lounge. The whole atmosphere from the first greeting, picking a tattoo to the end product was excellent. Customer Service went above and beyond. Thanks! spencer ‎ - Sep 22, 2011 Great service and very talented tattoo artists. Would recommend this place to anyone wanting a tattoo. Great service, great coloring and design, all around a successful tattoo shop. Max ‎ - Sep 21, 2011 So i got my first tattoo here and they were really nice helping me with my design and doing the procedure. The color looks great and everything is healing fine. Very happy with their work. Tony Montez ‎ - Aug 30, 2011 The people here are nice and professional when I had questions about getting a tattoo. The place is very clean and is very well worth the visit, especially for first timers. I recommend this to all my friends and family. Don't be afraid of getting your first tattoo, just start off small tho. ​Katers ‎ - Sep 27, 2011 I'm a tattoo snob and the work here is pretty awesome. I highly recommend if you are in the area, that you stop in. Two thumbs up!!!! Devin ‎ - Sep 19, 2011 Spent tons of time doing research before my first tattoo and the staff @ Executive Tattoo Lounge was extremely helpful in answering all my questions, showing me samples of work they had done in the past and overall making me feel comfortable about getting my first tattoo. The work came out great and I'm happy to say i'm a very satisfied customer and recommend these artists to everyone. Angela ‎ - Sep 19, 2011 Incredible service, beautiful art and a wonderful owner. Don't choose anyone else! Probably the most successful tattoo shop in Las Vegas. GINA ‎ - Sep 15, 2011 I love this place! I have gotten all of my tattoos here (Only 3 of them) but I will never go anywhere else. They are exceptional and have tons of art to choose from. tripp ‎ - Sep 11, 2011 Best tattoos in town. I've heard such great things about these guys. The artwork is superb, the prices are great, they're extremely professional, and best of all, they know their stuff. Nickdandrea ‎ - Sep 12, 2011 I love this place ! I got my first tattoo from Tattoo Lounge about a month ago and I could not complain about anything. The service was great, and the price was well worth it! I got a quote in ancient green on my upper back which looks amazing! excellent customer service-Smitty Excellent customer service- Loved the personal touch. 1st tattoo! Thanks for helping me with the custom design. It's beautiful. Would not change a thing! Great overall experience.Would highly recommend.